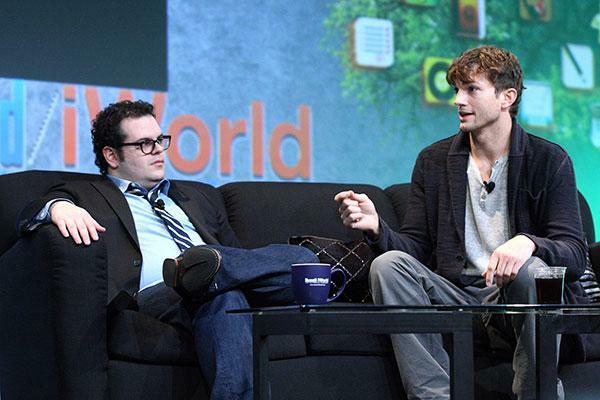 The 29th annual Macworld conference kicked off today at the Moscone Center in San Francisco with Macworld GM Paul Kent interviewing Ashton Kutcher and Josh Gad, stars of the Steve Jobs biopic JOBS. The two actors talked about the roles they took on, with Kutcher surprising the crowd with some serious Apple nerd cred. Kent opened up the interview asking the two stars how much they knew about Apple before taking on the roles and how familiar they were with Apple products. Gad admitted to a certain level of tech illiteracy, especially with regard to Apple. "I didn't know much about the journey that it took to get to Apple," Gad said. "I was a late converter, I think, I didn't catch on until around the time the iPod launched. My wife brought home this computer and it changed my idea of what a computer could be, as far as ease of use." Kutcher, however, drew applause from the audience when he revealed, "Yeah, I had an Apple IIGS when i was just a young kid. My dad brought it home. Really, all I did was play this game Number Munchers, and my favorite thing to do was going into the control panel to mess around with stuff." Kutcher said, though, that that was when he was much younger. He fell out of technology shortly thereafter, only getting back into it after he went to college to study engineering. Over the course of an hour, the two actors joked and talked with their host, explaining the thinking that went into their approach to portraying the two tech icons. "[Steve Jobs] is kind of a hero," said Kutcher, "so when I was looking at the script, I saw some things where I said, 'Hey, hold on a second!' ... I met with [JOBS director] Josh Stern, and he felt the same way." Gad said he knew little about Steve Wozniak before taking on the part. "I had talked to Josh Stern about taking on this thing. My knowledge of Steve Wozniak was, y'know, 'Dancing with the Stars.'" Josh Gad takes on the role of Steve Wozniak. The two also addressed the minor controversy stemming from Steve Wozniak's recent comments on advance footage of the film. Gad said he hopes Woz gives the film a fair chance. "I adore Steve Wozniak," Gad gushed," I greatly appreciate that man and I hope that when he sees the movie in its entirety he will understand that we went to great lengths ... It was an intensive journey, and I know it was the same for Ashton. This was done with the utmost love, admiration, and respect." Kutcher elaborated, hoping to put to rest complaints over the film's inaccuracies. "We weren't there. In filmmaking, you have to make a narrative that plays. You have to ride the arc of the entertainment of the film and stay true to who the people were and how the people were." In all, the two said they believed they'd both been changed by the roles they played, influenced by the legacy of the two tech visionaries. Wozniak's book and life story, Gad said, inspired him to allow for intense focus and work, but also revealed to him the necessity of taking time away from that intensity in order to seek inspiration elsewhere. "So now, I watch whales," the actor joked. For Kutcher, Jobs' example showed him the importance of focus, as well as not to try switching to a fruit-only diet. "For a month, I ate only grapes and drank carrot juice, and before we started shooting I just doubled over in pain," he said, describing the unfortunate consequences of an attempt to follow in Jobs' dietary footsteps. Upon going to the hospital, the doctors told him he had developed pancreatitis. "I don't know if it can be tied directly to a fruitarian diet, but I developed pancreatitis before the shoot, and it was kind of scary." Gad summed up the forthcoming film, saying aspects of it are kind of like a buddy movie. "It really is the story of this, sort of John Lennon Paul McCartney, this once-in-a-lifetime duo of people who really complemented each other," he said. "The idea that these two would meet and it would be this sort of perfect storm kind of fascinated me." JOBS is slated to open nationwide on April 19.